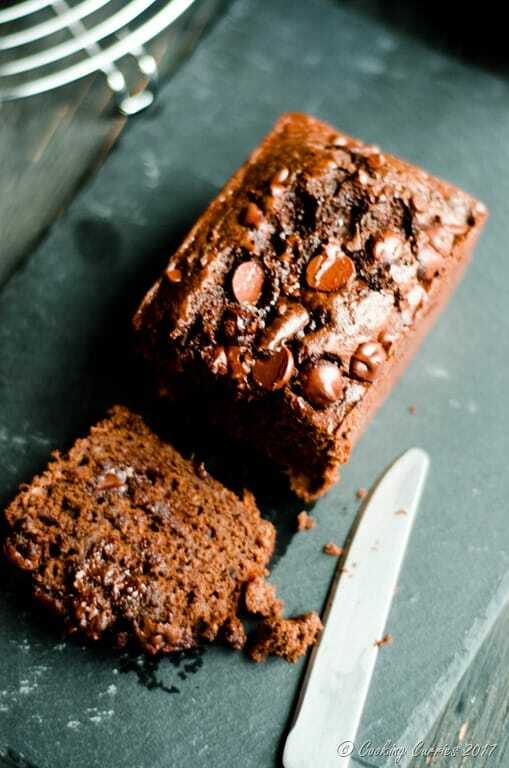 Chocolate-y quick bread with the goodness of bananas, this Chocolate Banana Bread can be a dessert or a snack even! I generally don’t bake many bread. I mean, the yeasty kind. I am always intimidated by the yeast. The first few times I tried several years ago, I just couldn’t get the yeast to work properly and ended up killing the yeast. At that time, I had just started baking, so I did not even know that’s what I did and made the bread anyway. The dough did not rise, but I baked it anyway. And I got a very flat dense bread. I did not want to try again and waste all the dough. So, I just gave up. I know! Very bad! The now me says I should have tried again till I got it right. Well, the then me didn’t think so. But I still loved baking and these quick breads came to my rescue. I used to make simple plain Banana bread all the time. I loved it. AJ loved it. And I would experiment with walnuts in it, chocolate chips in it, or with streusel toppings. I could bake a banana bread any day! A couple of months ago, I came across some over ripe bananas I had saved in the freezer, to make banana bread some day. But I really wanted to have a very rich chocolate something. 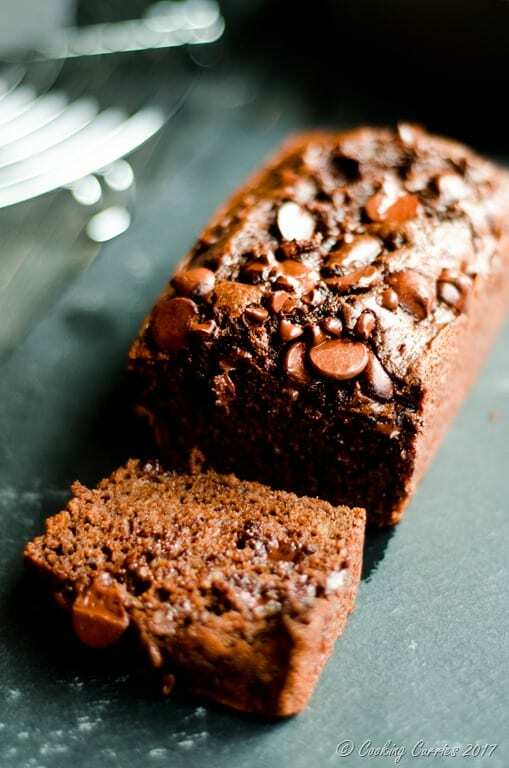 So I combined the two and made a moist, rich and luscious Chocolate Banana Bread. There are a few tricks that I used in this recipe that makes it so good! I always use a little coffee / espresso with my chocolate anything. It just brings out the chocolate flavor so much more. I topped the loaf with some chocolate chips right before I put it in to bake. That just formed a nice chocolatey topping that almost made it like a frosting. And of course, along with cocoa powder I used chocolate chips in the batter too. It is especially nice when you eat the cake warm, when you get ooey gooey bits of chocolate in between. I’m telling you, it’s the best thing ever! I used molasses and white sugar instead of just brown sugar. I think the liquid molasses helped keep the cake moist. 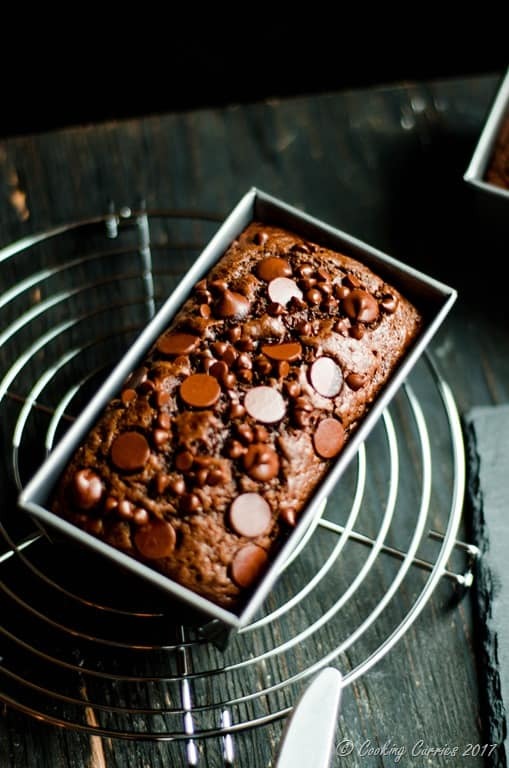 Enough talk about the chocolate banana bread and lets move on to the recipe, shall we? I know I want to, so I can make it again and enjoy it all over again. The base recipe for the Banana Bread is from David Lebovitz, the one and only banana bread recipe I would follow. 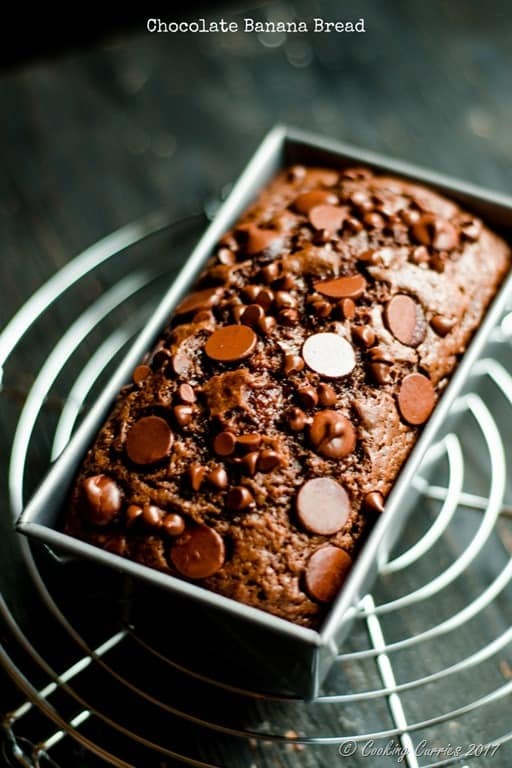 I modified to accommodate the chocolate in it, for this Chocolate Banana Bread. Preheat oven to 350F. Grease a loaf pan with some butter / oil and set aside. Sift the flour, cocoa, baking powder, baking soda and salt to a medium mixing bowl. Mix together the mashed banana, sugar, molasses, melted butter, eggs and sour cream in a large mixing bowl. 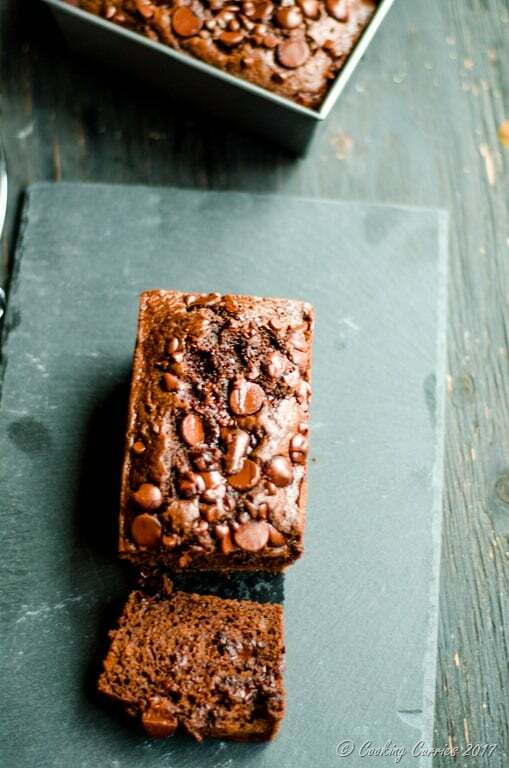 Add the espresso powder, vanilla, 3/4 cup chocolate chips and the dry ingredients mix to this. Stir until just mixed. Do not over mix. Remove pan from oven and cool on a cooling rack for 10 mins. 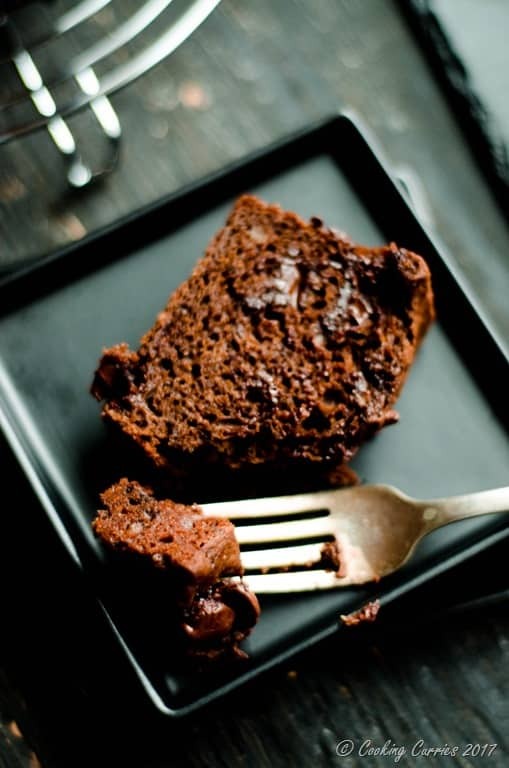 Run a knife along the edges of the pan and gently tip over the cake onto the cooking rack. 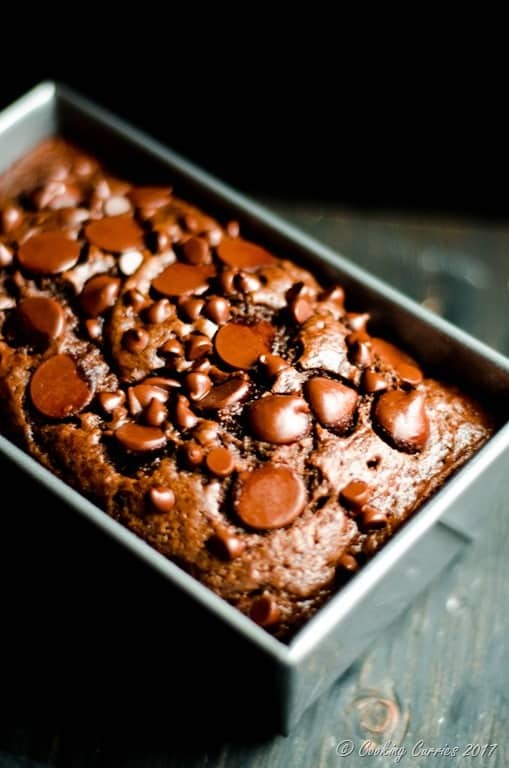 Carefully, invert the cake immediately to right side up, as you dont want to squish the melted chocolate chips on top. Cut and serve warm.